Okay - I know it's been far too long between posts! So what have I been doing?? This is the most recent finished item - made for a friend in Newfoundland having a radical mastectomy today. Thought it would make her feel better when she comes home to have something soft and cuddly to wrap herself in. 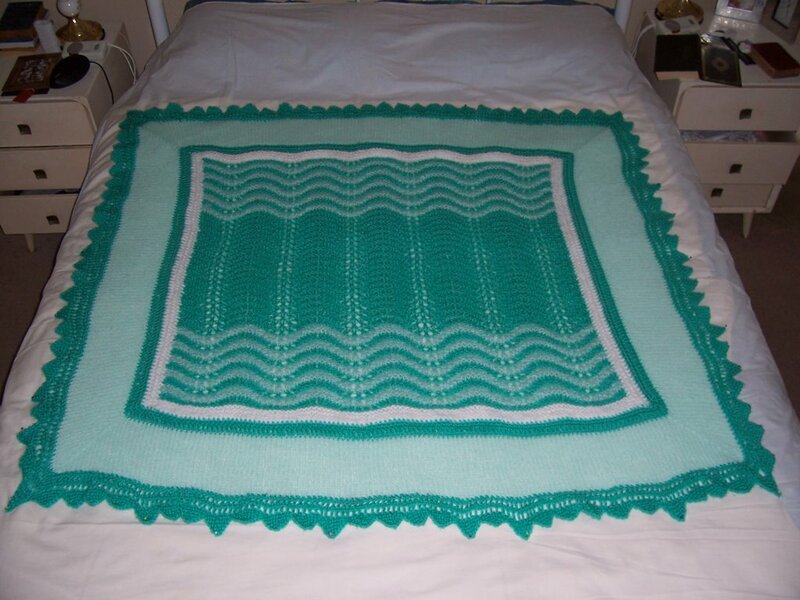 I started with a rectangle in feather and fan, using some Twilley's Capricorn in Jade Green and Mint stripes, then I crocheted around the edge with white and Jade, then picked up and knitted a border in Angoretta Mint Green using a circular needle - and mitreing the corners as I went - then I got really smart, and found a knitted lace edging that was originally for a baby's top - using Jade Capricorn , then at the end of every right side row I picked up a stitch from the Angoretta border - this created a gorgeous afghan with no seaming. I knitted the centre very quickly, but took about two weeks to work out in my head what I was going to do next to make it larger, as the centre was only baby blanket sized. 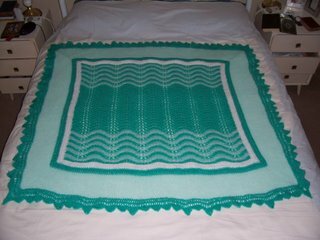 I had been knitting lots of a tiny version of Elizabeth Zimmermann's BSJ, and it came to me that the mitred corners would work well on the blanket too. What a FABULOUS gift! It's beautiful - and I know your friend will feel WELL loved when she wrapped up all in your creation!